Acrylic Sign Holder - 5½" x 7"
Display your signs and advertisements in this Acrylic Sign Holder that fits on grid or slatwall. Your signs and advertisements are protected inside the holder. Since the Acrylic Sign Holder fits directly into a grid or slatwall, you can move your signs and advertisements with ease to conveniently display then exactly where you need to. This specific sign holder is 5-1/2"H x 7"W and is available for immediate shipment. Store Supply Warehouse also carries other slatwall display options and accessories. I am very satisfied with my purchase here. I ordered multiple items and I received everything super fast and everything was packaged very carefully. The sign holder were in very good condition, all very clean, free of scratches. The 5.5 X 7 is a great size, not too small, not too large. These do not take any shelf space and stay in place very well in slant panel grooves. These are very good quality perfect for highlighting sale items. They fit perfect with the 2' x 6' standing grids. We use these on our slatwall & they work really well! Save yourself time & hassle - get the pre-cut blank signs too! These are very good sign holders, however I wish the back secured to the grid panel better. Great way to display additional information on your gridwall without paying a lot for it. They are a little smaller than I would of liked but with bright paper in them they bring notice to the items. I will be ordering more of these little gems....they sit real snug on display and are very noticeable. I rate these a 5! Exactly as described, great value, excellent customer care! I have a wholesale cellphones and accessories business, and this item allowes me to insert the different model names for my dealers to see which model they are looking at. good quality and price! Looks great on the grid wall. 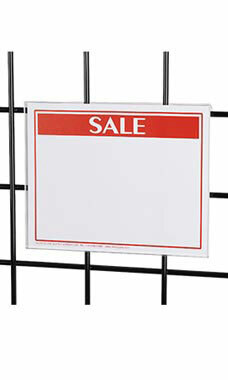 This item works well for displaying store policies,specials, notices, etc.